Carnival of Space #39 is now on display at Visual Astronomy. I won't have time to check it out in detail myself until Saturday, but a lot of my favorite blogs are there discussing the usual wide range of space and astronomy topics. I'm really too busy to blog this week, but I wanted to briefly note today's 50th anniversary of the launch of Explorer 1 on January 31, 1958. Developed by JPL, Explorer 1 was the United States' first successful satellite. Astroprof has a good post on Explorer 1. 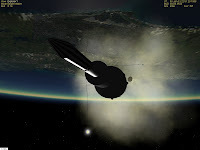 The picture shows an add-on version of Explorer 1 simulated in Orbiter (you can see the first stage falling away in the smoke following stage separation). This add-on is by Jim Williams and it features a launch autopilot and some sounds, including the original launch countdown. Another Explorer 1 add-on was released yesterday but I don't know too much about that version. The brief clips in this video certainly don't do it justice, but they do give you some idea of the magical visuals and a glimpse of some of the amazing acrobatic performances in the Cirque du Soleil show "The Beatles LOVE." I saw it tonight at the Mirage in Las Vegas, and it is really breathtaking. The sound, the staging, the lighting, the performances, the pacing - just wonderful. Of course the Beatles' music is wonderful on its own, but this show manages to turn it into a new experience. Astroprof's blog is full of teaching moments derived from whatever is going on in universe at the moment. As someone who teaches astronomy classes, he knows how to explain what's going on in an accurate but understandable way. A case in point is his current post on widely-discussed asteroid 2007 WD5 which will pass close to (but most likely not hit) Mars on January 30. His explanation of what it means to say that there is a "4% chance" (or whatever) of the asteroid colliding with Mars is great, complete with very helpful diagrams. I won't repeat it here, but I would like to comment on what measurements can be used to determine the orbital paths of asteroids and other solar system objects. In the not-too-distant past, the positions of solar system objects were determined by measurements on photographic plates. If the object is close enough and moving fast enough relative to the Earth, a series of photos taken over days, weeks, or months will show a shift against the known background stars. Multiple 2D points can be mathematically fit to equations from which the orbital elements can be calculated (see P.S. below), but if the angular shifts are small, and if the object is not very bright, the relative error in the measurements can be pretty large, leading to the orbital position uncertainties that Astroprof describes. Nowadays the "plates" are likely to be data from CCD arrays, and such optical data can sometimes be supplemented by radar data which can give not only angular position, but also velocity data derived from Doppler changes in the frequency of the return signal. But there are still errors in these data. Multiple measurements can be used to average out the errors and calculate more reliable elements. Measurements always have errors, but by understanding the errors, and by combining multiple measurements in the right way, scientists and engineers can get a good handle on the reliability of predictions made with the measured data. P.S. Out of curiosity I searched for programs that can use astrometric observations and determine orbital elements from them. There are probably many others, and I haven't used any myself, but two free programs that look interesting are Find_Orb (which has a compiled Windows version for download) and Orb_Fit (which seems to be more Unix and do-it-yourself oriented, but perhaps more general). Another freeware one that looks great judging from screen shots and sample animations is ORSA, though it seems to be "some assembly required" to install needed data files. It seems to do a lot of cool stuff, not only orbit determination. I think I must have heard something about this before, but I just (re? )discovered this excellent video teaser for an in-work film called "Man Conquers Space," an alternate history "documentary" of a greatly accelerated space program that puts humans on Mars in 1968. It's based on the plans laid out by Wernher von Braun in the early 1950's in a series of articles in Collier's Magazine, illustrated with paintings by Chesley Bonestell. Unfortunately I can't find anything on a release date for the film - perhaps they are still looking for funding. In the meantime I will mention again that you can explore this alternate space program first hand through the great Orbiter add-on "World of Colliers" by Erik Anderson and John Graves. It may not look quite as good as the CGI in the movie teaser, but it's available now, and you can fly 'em yourself. Science Illustrated is a new magazine that I picked up at the airport yesterday (the web site is just a placeholder with some graphics and general info now). January/February 2008 is the premiere American issue but an editorial says it has been published in Denmark for some time and is very popular in Scandinavia. I read several articles and I like it. It's roughly the technical level of Discover magazine but with more and generally better graphics. The writing is easy to understand but not "dumbed down" (though they could use a better spell checker). The subjects included paleontology, zoology, cosmology, climate, biomedical engineering, astronomy, and space - a nice mix. The space article was about human exploration of the outer planets (HOPE), a NASA study that I had not read about before (nice 2003 presentation PDF here). This morning's planned Grand Canyon tour was canceled due to bad weather, but instead of going back to bed as I should have done, I've been reading a book and some web sites and reviewing some developments in Orbiter add-ons. One that continues to fascinate me is the VASIMR project by Nick Dimitrov. 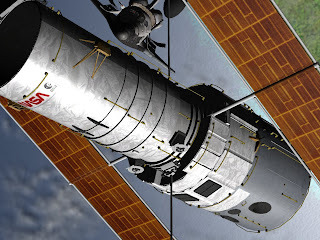 He has released USS Bekuo VASIMR v.1.01, which adds a Mars lander and other improvements (see discussion in this Orbiter Forum thread). It now looks just like the Mars-bound spacecraft shown in this NASA concept video, and you can undock the Mars lander and take it down to the surface, though I didn't do too well on my first and only manual attempt. The Mars lander is a nice touch, but the really cool thing in Nick's add-on is the propulsion modeling. VASIMR stands for variable specific impulse magnetoplasma rocket, and the add-on models this variable specific impulse feature. What does this mean? "Specific impulse" (ISP) is something like fuel efficiency, and with the VASIMR, you can tune the performance continuously, from low thrust and high efficiency through higher (but still not huge) thrust with lower efficiency. Even a small force can lead to large velocity if it is applied for a long time, and this is the secret to shorter interplanetary flight times - using an engine that is so stingy with your fuel that you can afford to run it continuously. 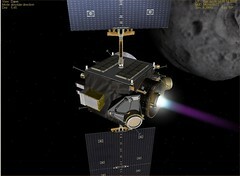 Running the engine continuously instead of with relatively short "burns" requires special trajectory planning techniques as used for the Dawn spacecraft which is using ion engines on its long flight to visit Ceres and Vesta. For a good explanation of VASIMR by its inventor, Dr. Franklin Chang-Diaz, watch this 5 minute "NASA Connects" educational video segment. I noticed that VASIMR is shown as a trademark in some cases now (with a TM symbol), and I found that in addition to his work for NASA, Dr. Chang-Diaz also has a company, Ad Astra Rocket Company, which is working on the development and commercialization of VASIMR technology. Ad Astra also has a subsidiary in Costa Rica, which is really cool. There's a video clip (also found here) on their home page showing a lab test of a VASIMR prototype. As many people have said, predictions are difficult to make, especially about the future. But VASIMR is a really promising technology that could play an important role in making the resources of the solar system available to humanity. 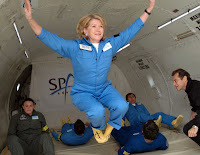 I'm in Las Vegas, and while I wish I could say it's for a zero-G flight (that's not me flying with Martha Stewart), it's actually to help host some international business partners for a couple of days as the entertainment part of our annual meeting. If the weather cooperates tomorrow morning, I'll accompany a couple of the more adventurous visitors on an aerial tour of the Grand Canyon area, landing at the West Rim to "walk the sky" 4000 feet above the floor at the Grand Canyon Sky Walk. It's not zero-G but it's pretty cool, and I'll find out if it feels more like flying at 4000 feet (which I love) or standing on the edge of a 4000 foot cliff (not so much). Of course we'll also take our guests for some nice meals and a Vegas show (The Beatles LOVE at the Mirage). So it's certainly not a hardship business trip, though I have my usual mixed feelings about Las Vegas. It's a lot more elegant (and expensive) than it used to be, but it still creeps me out somehow. (Begin Curmudgeon Mode) Nothing against marketing and having fun, but Vegas is too contrived and too much "in your face" for my taste. Sell sell sell. Gamble gamble gamble (I don't enjoy it, so I don't). Eat, drink, play, have fun. Gamble some more. Repeat ad nauseam. I guess I sound like a spoilsport. Sure I will enjoy the socializing, the nice meals, and the Beatles show, and no one is forcing me to gamble. But Vegas is just too much of everything! (End Curmudgeon Mode) And as American as apple pie! Models, graphics, and videos of Virgin Galactic's SpaceShipTwo were unveiled yesterday, and it looks like a pretty sweet ride. The "flight simulation" video is not much different from an earlier version posted last year, but the design of the spaceship and its carrier aircraft have been updated and are (presumably) closer to what will actually fly. The paint scheme is new too. I do want to do a suborbital (or better) spaceflight someday, but the $200K introductory price is just a bit out of my price range at the moment. Check out Carnival of Space #38 over at Sorting Out Science. The detective story format is a little unconventional, but you'll find numerous clues to the subjects of the blog posts sprinkled through the text (plus there's that handy mouse-hover thing that shows you the link itself down at the bottom of your browser window). P.S. The "Dirk Galaxy - Space Detective" logo has nothing to do with the carnival (which features Shorty Barlow, private eye), or with space for that matter, it was just the result of a Google image search. But I listened to the latest (2003) episode and it had some amusing moments, especially if you like Maxwell Smart impressions. There's a great little article in this week's Space Review by David Livingston, host of The Space Show. The question was, "is manned space exploration worth the cost?" and you can read the article yourself for the background on exactly how this came up. Livingston makes several points, the first being one that I have often noted, which is the rather obvious fact that money spent "on space" is in fact spent right here, mostly in the US, and mostly to employ Americans of many occupations, not only scientists, engineers, and astronauts. He also notes that there are various types of "government programs," some of which only cover immediate expenses of various sorts with no long-term benefits, and others (like the space program) that contribute to education, industrial growth, spin-off technologies, and new business development. Space has also been an area of peaceful international cooperation that has emphasized and supported interests shared by many countries, including countries that have not tended to be all that friendly otherwise (think the USA and the former USSR in the seventies and eighties). Finally he notes that for a well-run manned space program (for which he uses Apollo as the prime example), there are important "human spin-offs." I am one of many engineers and scientists who chose to pursue a technical education and career in large part because of the inspiration of the Mercury, Gemini, and Apollo programs that took place when I was growing up in the sixties. This is a legacy unmatched by any other government program you can name. Space exploration (human and robotic) is definitely worth what we spend on it, and on many different levels. It's my favorite 0.6% of the federal budget and I wish it could be more! Last night I stumbled on this article, which is an edited version of the introduction to Peak Everything: Waking Up to the Century of Declines by Richard Heinberg. It's a very interesting and sobering article, and I was intrigued enough to order the book from Amazon (oh my aching reading stack!). Heinberg has written previously on "peak oil," the idea that as the world runs out of cheap oil (and natural gas), that major changes are in store for human societies across a wide front, because so much of what we take for granted depends on cheap oil. This applies to more than driving our cars and heating our homes - most aspects of industry, agriculture, and transport are impacted, not to mention global politics and war. And it's happening now, or very soon, not hundreds of years in the future. Our starting point, then, is the realization that we are today living at the end of the period of greatest material abundance in human history - an abundance based on temporary sources of cheap energy that made all else possible. Now that the most important of those sources are entering their inevitable sunset phase, we are at the beginning of a period of overall societal contraction. I'm looking forward to learning more about this from the book, but two thoughts occur to me now. What about solar? And what about space? 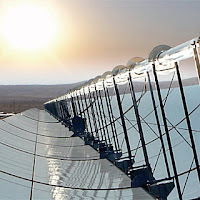 I wrote recently about a "grand solar" plan described in a current article in Scientific American. This approach has a lot of promise at least for the US where we have large regions (mainly the southwest) where solar energy "farms" could be very efficient. We are swimming in solar energy if we could only harness it efficiently, and if the coming end of cheap oil and other resources is going to lead to massive social declines and more war and chaos, why isn't solar energy the new Manhattan Project? And then there is space, where solar energy is abundant and constant (though a ground based solar plan is probably more practical in the short run than solar power satellites), and where there are massive material resources on the moon and in near-Earth asteroids. Certainly the Earth is finite, but the inner solar system has tremendous additional resources, including metals, gases, water, Helium-3, etc. These resources in space will take years to develop, but they could lead to new sources of important and rare materials such as platinum, new energy sources (solar power satellites, helium-3 fusion reactors), and even new places for humans to live (space habitats, Moon and Mars colonies). Of course these are not short-term solutions. But knowing that we are running out of easily accessible energy and material resources on the Earth, it seems to me that we should be working on this more than we are. We should be expanding our national and international efforts in space technology and development, and working on ways to encourage commercial development and investment in future solutions from space. This may not seem as pressing as many of our current problems (maybe giving every American a few hundred dollars in tax rebates is a good way to spend another $145 billion in borrowed government money and will hold off a recession, or maybe not). But in the long run, I think it's literally a matter of survival. I've got so much I need to be doing that I really shouldn't even be looking at Orbiter toys, but there are some cool new add-ons I wanted to try. So far I've only had time to install them and take a few quick pix. So I'll just give a little preview and then get back to work. Scott Conklin ("Usonian" on the Orbiter forum) has released MER-2003, his detailed version of the Mars Exploration Rover missions which launched in 2003 and arrived on Mars in early 2004. Of course the real Spirit and Opportunity are amazingly still active after four Earth years, and with Scott's add-on and documentation, you can re-create the major parts of this mission from launch to landing, and even drive and operate the robot arm on the simulated and animated rovers. 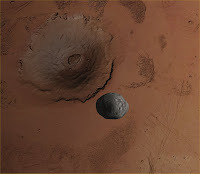 Multiple scenarios are provided so you don't have to fly the whole mission just to play around on Mars. Additional free add-ons are needed for the Delta launch vehicle and for interplanetary navigation (IMFD). The included manual tells what you need and how to install and use it. Very cool. Another recent one I like is the USS Bekua VASIMR (links to several good references are on that page) by "nickd." I will have to write more about this later, but this add-on models a NASA interplanetary spacecraft design based on a next-generation propulsion system that NASA has investigated for several years (I don't know the current status, but funding for such advanced propulsion system research has been tough for a long time - this 2002 article is a good overview). VASIMR stands for Variable Specific Impulse Magnetoplasma Rocket and it would require a nuclear reactor to provide the electrical power to drive it. This project has been led and championed by astronaut and plasma physicist Franklin Chang-Diaz and offers the potential for much faster interplanetary flights. Darnell Clayton of Colony Worlds has done a great job presenting this week's thirty-seventh Carnival of Space. With wonderful images now arriving from MESSENGER (above), Mercury figures in several posts, but the range includes stars and galaxies, interstellar probes and and even wandering black holes. Check it out. As a sort of unintentional follow-up to my recent post on the modern slave trade, I happened to rent and watch the movie Amazing Grace. It's the story of William Wilberforce, the British Member of Parliament in the late eighteenth and early nineteenth centuries who led a many-year political battle to end the slave trade in the British Empire. It was finally banned in 1807 (the movie was released in March 2007 to coincide with this anniversary). This is an excellent and very engaging movie that is also inspiring and educational. Highly recommended. One of the nice things about a job that usually only needs a computer, a web connection, and a phone is that you can pretty much work anywhere. 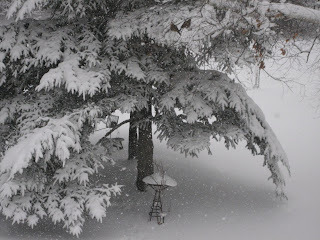 Of course the bad news is that you can also work pretty much any time and often do, but the flexibility is nice, especially when a big snowstorm hits as it has this morning here in New England. So today I'm working in the dining room with the dog at my feet and the iPod plugged into the stereo, enjoying the snowy scene outside until I feel guilty enough to take a break and shovel the front walk (I've already taken a break to blog!). We've got a few bird feeders set up out back (see above) so I'm also checking on the birds now and then. We get various birds including junkos, mourning doves, house finches, chickadees, goldfinches, and even a pair of cardinals. I'm not a serious bird watcher or anything, but it's fun to see them up close. Even with help from feeders, birds have it pretty tough in the winter. It amazes me that most of them manage to survive. How do they do it? It turns out that some people know quite a lot about this subject, and I found a great book called Winter World: The Ingenuity of Animal Survival by Bernd Heinrich. Heinrich is a professor of biology at the University of Vermont, and he also spends a lot of time at his cabin in the western Maine woods. He's an incredible observer of the fine details of the winter world (not only birds), a naturalist in the grand tradition, but also one who will do things like experimentally investigate the thermodynamics of small birds (he finds dead birds, heats them up, and measures the rate of heat loss with and without the feathers to help estimate their "energy budget"). Small birds in the winter live constantly on the edge of freezing to death at night, and it's always a close thing whether they will manage to consume enough food to make it to the next day. Let's keep those bird feeders full! The MESSENGER spacecraft is closing fast on its close encounter with Mercury tomorrow (the Planetary Society has a detailed preview here, flyby simulation video here). This will be the first close approach to Mercury since Mariner 10 in 1974-75, and it will be very close - only about 200 kilometers from the surface! This is the first of three flyby encounters in 2008-2009, designed both for imaging/science and for trajectory modifications that will help MESSENGER to match Mercury's orbit and allow Mercury orbit insertion in March 2011. The 2008 passes should finally give us imagery of Mercury's entire surface (Mariner 10 was only able to photograph about half of the planet on its three flyby encounters). The planned one-year orbital phase will allow much more detailed study of this relatively unknown planet. 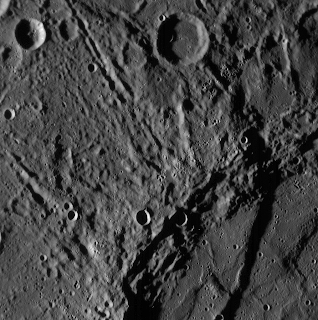 Launched in August 2004, MESSENGER's journey to Mercury has taken a rather indirect path, looking something like a pinball in a pinball machine in in the animated GIF above (linked from the Planetary Society web site). MESSENGER got trajectory help from several gravitational-assistance passes (Earth flyby in 2005, two Venus flyby's in 2006 and 2007, and the upcoming Mercury passes in 2008 and 2009 - here's a great diagram of the stages of the trajectory). Since Mercury is close to the sun, you might wonder why all this bouncing around is necessary, since it's pretty much "downhill" from Earth to sun-hugging Mercury, gravitationally speaking. While I don't know the specific constraints on the MESSENGER trajectory design, there are always complex trade-offs among payload (the mass available for instruments and spacecraft structures), propellant mass and usage, and timing. If you can wait longer to get there and use gravitational assistance from planets, you can carry a larger payload while needing less propellant to arrive precisely at your target at the right time and with the right velocity to do what you need to do. This whole orbital mechanics business has interested me since high school. Aside from library books, I'm sure that the many "NASA Facts" and other documents that I got by writing to NASA played a big part. That was the Apollo era, so I was reading about free-return trajectories and orbital rendezvous and the like at a young age. At one point I thought that this might even be my career, since I was so interested in space and computers, but I took a path not unlike MESSENGER (with a music-assisted change in direction and university) and ended up in optics software instead. Nowadays at places like JPL, interplanetary trajectory design is incredibly sophisticated. Simulation, optimization, and visualization software make it possible to meet all sorts of constraints and requirements and to perform and pre-visualize all sorts of "what ifs." If you would like to play around with this sort of stuff yourself, there is the great combination of Orbiter and IMFD (Interplanetary MFD by Jarmo Nikkanen, a wonderful planning tool that runs inside Orbiter itself, now up to version 5.1d). Gravity Simulator 2.0 is another great and free tool for playing with orbits and trajectories. You can even use JPL Horizons data to get real spacecraft data to use in your own simulations (see my earlier tutorial post on this). Speaking of tutorials, I just found one for IMFD 5.0 that I had not seen before. It's a 20 minute narrated video tutorial by Robert Denny, and it's really cool (he has done earlier text/picture tutorials on IMFD which are still available, though they are based on an earlier version of IMFD). While this "simple tutorial" is very well done and clear, you should note a few points. One is that he assumes some basic familiarity with Orbiter and with orbital mechanics terminology. Another is that he is only showing the "MFD" instrument windows, not the full Orbiter screen. Orbiter has cockpit views, external views, and full 3D graphics, but for this tutorial, you are essentially "flying on instruments" and don't need to see that other stuff, though you would see the outside view if you were running this in Orbiter. Third is that Denny has chosen to transfer from Europa to Callisto, two moons of Jupiter. 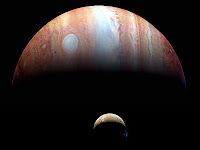 Jupiter is like a mini (but still huge!) solar system, so it's quicker and simpler in some ways to learn to do orbital transfers between moons there than between widely separated planets orbiting the sun. The same methods would apply to flying from (say) Earth orbit to Mars orbit. Even if you don't understand everything, you can see from this tutorial what a powerful tool IMFD can be, and it goes much farther than what is shown here. There are other (non-video) IMFD tutorials on Jarmo's site. NASA introduced a much-needed redesign of its main web pages a few months back, but due to some problem with my computer that was interacting with something in the new NASA web pages, I was unable to view the site until yesterday. I finally got some debugging help and we figured out that it was Symantec Client Firewall that didn't like something about NASA's new design. We never figured out exactly what it was, but by turning off the firewall, loading the site, and then re-activating the firewall, it worked, and it still seems to work today after a reboot. Weird, but OK. The new NASA web design is a huge improvement, modern and easier to navigate, with various "MyNASA" customization features like bookmarks and play lists. It's pretty cool. One of the first things I noted was a page with details on the upcoming final service mission to the Hubble Space Telescope, STS-125 now planned for Atlantis in August. I had read some news about this on several blogs that were reporting from the AAS conference in Texas, where NASA presented details of the mission this week (PDF slides are here). It will be a very exciting and challenging mission, and the upgrades to HST will greatly extend its life and capabilities. Three Hubble service mission veterans will be on the crew, and it will take five spacewalks to accomplish all the repairs and upgrades. 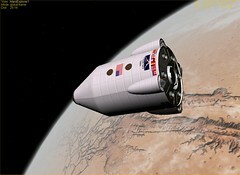 You can experience some aspects of the HST service mission using Orbiter (as shown above). 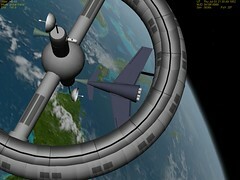 Orbiter includes some scenarios with the HST, and there's also a much improved add-on version available. While you won't be able to make the repairs, you can fly the shuttle (the standard Atlantis or the more realistic shuttle fleet version) to rendezvous with HST and capture it with the shuttle's robotic arm. It's pretty obvious that the Earth gets a lot of sunlight. The solar energy received by the Earth in 40 minutes is equivalent to world energy use for a year. So why aren't we using more of this bountiful and free resource? Of course there are many reasons, including the fact that it's dark at night, skies are often cloudy, and the technology to convert solar energy to electricity is still relatively expensive and inefficient. There are solutions to these problems, for example, orbiting (probably GEO) solar power satellites (SPS) could solve the night and cloud problems, converting constant sunlight to electricity which would be transmitted in concentrated microwave beams down to arrays of antennas on Earth for conversion back to electricity. We could even eventually use lunar materials for SPS construction outside of Earth's deep gravity well. I'm a big fan of space development, but it's clear that there are a lot of problems to solve before we can put huge SPS systems into space. The heavy lift infrastructure just isn't there yet. Could space elevators help? Sure, but even if they turn out to be feasible, development and deployment are certainly years away. Isn't there something we can do with the sunlight reaching the Earth's surface, using what we already know how to do? According to this fascinating article in the January 2008 Scientific American, there is. The "grand solar plan" provides specific details on how we could build a practical solar energy infrastructure based on known technologies with modest and expected improvements over the next 40 years. According to the authors, this plan could provide 69% of the U.S.'s electricity and 35% of its total energy by 2050. It would require construction of very large ground-based solar arrays in the American southwest and utilize compressed air storage in underground caverns to store energy for use at night. It would also require building long distance HVDC (high voltage direct current) power lines to distribute the power efficiently from the southwest to other regions. This plan would require the federal government to invest more than $400 billion over the next 40 years to complete the plan, but this investment would have many benefits including greatly reduced dependence on foreign oil and gas supplies. Developing the political will to follow such a plan is perhaps the biggest hurdle, but the authors point out that the annual expense would be less than the current U.S. Farm Price Support Program. The Iraq War has already cost us more in dollars alone. There's much more to it than this, and I urge you to read the full article and look at the accompanying graphics and diagrams. It's a well thought-out plan, and while I'm sure there are pitfalls and complications beyond those discussed in the article, it certainly seems feasible. It's not a Manhattan Project or an Apollo that depends on numerous technology breakthroughs to succeed. It's really an infrastructure development project that builds on existing technologies and industries and makes wonderful use of one of the few things that are free in this world: sunlight! Carnival of Space #36 is available for your reading pleasure over at Dynamics of Cats. Just as my "Music of the Spheres" is only occasionally about music and only vaguely about spheres, Dynamics of Cats is mostly an astronomy blog with a lot of random stuff thrown in (the blog name is explained here - I was curious and had to look this up). Some very good stuff this week. I especially loved the post with a long-lost video of a very unusual test of the first Saturn V in 1966. Today's Astronomy Picture of the Day (top) is a cool montage of Jupiter and its volcanic moon Io, created from New Horizons imagery (passing by for a little gravity boost on its way to Pluto). 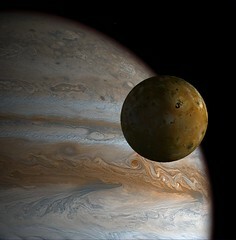 The other picture is one of my Orbiter screen shots of Io with Jupiter. I think it's pretty sweet even though it doesn't have an erupting volcano on the limb like the NASA picture. Many more Orbiter pix on Flickr. Apollo was amazing. You knew that already, but having just finished Andrew Chaikin’s A Man on the Moon, it’s especially fresh in my mind. Of course the U.S. spent a huge amount of money to win the race to the moon, and while that Cold War-driven goal may have been why it was funded, it wasn’t the reason that so many thousands of people dedicated their lives to making their part of Apollo as close to perfect as it could be. Public interest may have fallen fast after Apollo 11, but it was clear to the people involved that Apollo was something big. Leaving Earth for other worlds will someday be as commonplace as flying from Boston to Los Angeles, but to know that you are part of making that happen for the first time, to know that you own a piece of that history, that had to be really something special, whatever your role in the program (and if you had any role at all in those glory years, I want to thank and salute you for your fine work - you did us all proud). That it all took place over a mere 11½ years (from JFK’s speech on May 25, 1961 to December 14, 1972 when Apollo 17 lifted off from the Moon) is even more astounding. How was it possible? To support that degree of focus, that alignment of national goals with untold numbers of “just-now-possible” technologies? And more importantly, with the legions of technically educated, talented, and dedicated people available to make it happen? Apollo certainly set the bar extremely high for any future space programs. It’s an interesting thing about space missions that when they go well, people comment on how NASA “makes it look easy,” and after the first mission they get bored until an Apollo 13, Challenger, or Columbia reminds everyone that it’s not easy at all, and never really was (then they forget again). 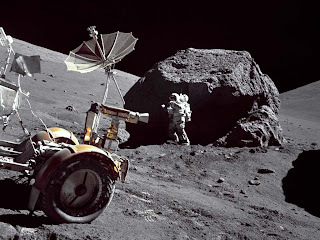 NASA landed six crews on the Moon between July 1969 and December 1972. Only Apollo 13 failed to make its planned landing, and that amazing rescue probably contributed as much as Apollo 11 and 12 did to preparing everyone for Apollo 14 and the three “J-series” missions that concluded the program (Apollo 15, 16, and 17 featured extended surface stays made possible by an expanded LM payload that including the Lunar Rover). But what about the future? Why has no one gone more than 800 kilometers from this planet for 35 years? People who care about space know all about this, the lack of public interest, the lack of vision, the lack of funds, the shuttle and space station decisions, going in circles and all that. I happen to think that the ISS and shuttle experience will ultimately pay off – the international cooperation, the extended time in space, getting better at building stuff up there. Many are frustrated with the slow pace of moving beyond Earth orbit again, with NASA’s “Apollo 2.0” approach to Constellation, with arguments about whether the Moon is even interesting enough to bother going back (I’m sure it will pay off), or whether we should push straight on to Mars (I think it’s harder than Zubrin says it is). I feel some of the frustration too. I’m not getting any younger. I want to see people on Mars as soon as someone can try it with a reasonable chance of success, but I think we could also use some practice just a few days out from Earth, and maybe even fly some few-month asteroid missions to warm up. I don’t know what’s going to happen with US government funding for space in the next few administrations, but I’m not counting on anything like the 2004-2005 Vision for Space Exploration surviving intact. I hope that some of the heavy-lift launch vehicle infrastructure really gets built, and the Orion too, but I think that over the next 10-30 years, private space will make surprising progress (SpaceX, Bigelow, and I hope many others), and the new Asian space race will also have an impact, leading to extensive commercial and government operations in the Earth-Moon region, and expanded robotic and eventually human exploration of near-Earth asteroids and Mars. It may take us to 2051 to get to “2001” (the movie version that implicitly assumed an Apollo-like pace continuing for another 30 years), but we’ll get there. I guess this just means that I’m an optimist about space developments in the coming decades, and that I’m not assuming that NASA is the key to it all – though they have done and still do many great things, and certainly will continue to have a role, maybe even as a technology leader. I can’t prove it but I think there is reason for optimism and that there will be multiple paths to space, as well as plenty of reasons for more people to be interested and involved. As I take man's last step from the surface, back home for some time to come — but we believe not too long into the future — I'd like to just [say] what I believe history will record — that America's challenge of today has forged man's destiny of tomorrow. And, as we leave the Moon at Taurus-Littrow, we leave as we came and, God willing, as we shall return, with peace and hope for all mankind. Godspeed the crew of Apollo 17. It’s definitely taking humanity longer than Cernan and others at the time would have imagined to get back there (President Nixon got one thing right when he announced at the time, “This may be the last time in this century that men will walk on the Moon.”). Those thousands of Apollo workaholics and overachievers showed us the way, and even if it takes us a while longer to catch up to what they accomplished in those few astounding years, you can rest assured that we won’t be a one-planet species forever. This morning on the way to work I noticed a dark gray 2007 Prius exactly like mine, but it had US government plates with the tag number "EPA2326," so I assume this was an Environmental Protection Agency vehicle. While buying hybrid cars for the EPA fleet won't make the US government carbon neutral or anything, at least it makes a certain amount of sense. Yes we'll all go together when we go. Which leads me to the real subject of this post, simultaneity and Apollo 11. On John Walker’s Fourmilab site, there’s an article called “The Relativity of Simultaneity.” In it he points out that because of the finite speed of light, events separated by some distance can’t easily be defined as “simultaneous.” Depending on their locations, different observers can observe the same distant events occurring in a completely different order. He illustrates this with a clever animated GIF image (shown above) and also with a real-life example, the radio transmissions from Apollo 11 on July 20, 1969! The Moon is pretty close by astronomical standards, but it’s still about 1.3 light-seconds from Earth. This is a noticeable amount of time in human conversations, and Walker asked himself what effect this delay might have had in the radio conversations that took place during the final moments of the first Moon landing. Using audio editing software, the known Earth-Moon distance, and the documented times of the sound recordings made in Houston and on the Moon, he constructed an audio track that simulates the way Armstrong and Aldrin actually heard the conversation in the LM cockpit. He provides a stereo MP3 file (4'26" - about 4 MB) that has Houston’s transmissions on the right, transmissions from the Eagle to Earth in the center (mostly Buzz Aldrin), and Neil Armstrong’s LM-only intercom comments on the left. This recording sheds light on the pause in the middle of Neil’s first official “Tranquility Base” transmission. You can read Walker's article for more details on the problem and on what he did to create this recording. Very clever stuff. Carnival of Space #35: Bonus! Like missing socks that somehow show up behind the dryer, a few more posts were just forwarded to me. They aren't exactly "post-deadline papers" since they were actually submitted pretty early. I decided to make this a new post rather than editing the previous one - that way it will show up separately in the various feeds and perhaps some earlier visitors will take another look. Advancednano reports on space based solar power: There are two efforts to develop larger scale low earth orbit solar power. Currently the largest solar power systems in space are hundreds of kilowatts. The new plans are for a megawatt to tens of megawatts of power. The difference is having several smaller (260 meters instead of several kilometer square) receiving stations on the ground. Brian Dunbar of Space for Commerce asks an intriguing question: Could the gold standard be the killer app driving space development? And he makes a good point: You can't trust politicians about energy policy, but you can trust in wealth creation. Speaking of intriguing questions, Selenian Boondocks has a commercial message from the future: "Is the unreliability of lunar transportation getting you down? Are you tired of going splat just because someone forgot to tighten a bolt? Now unintentional lithobraking can be a thing of the past!" The answer: lunar ejection seats, of course! Clark at HobbySpace.com was looking back at 2007 and came up with a list of events, announcements, hardware progress, financial news, and other developments that occurred in 2007 in the NewSpace industry and community. Robot Guy was also looking back at 2007, and he summed it up with a great top ten space stories list (Ed, I still didn't get your email, so I hope this was the post you wanted to submit - it's a good one). And finally (I think! ), as 2007 was drawing to a close, instead of looking back, Stuart Atkinson of Cumbrian Sky was wondering what wonders and surprises 2008 will bring. It looks like this will be another exciting year in space! People have been busy with the usual late December holiday activities (or in my case, busy being not so busy), so you might have noticed that the Carnival of Space skipped a week. But now at least a few of our Intrepid Space Bloggers are back at their keyboards and mice, ready to take on the Universe, one post at a time. Welcome to Carnival of Space #35, our first blog carnival for 2008 (please also see this bonus post with a few more entries for today's carnival). Should we try to wake the neighbors? In Active SETI and the Public, Centauri Dreams looks at the question of whether broadcasting to the stars is a sound supplement to existing SETI searches, which involve listening (or looking) only. This post examines the issue in connection with David Grinspoon's recent article on the topic in SEED Magazine, and the comments set off a lively debate on the merits and potential dangers of such transmissions. Asteroid 2007 WD5 will have a (possibly very) close encounter with Mars later this month. This prompted A Babe in the Universe to riff a bit on the subject of asteroids (Asteroid Coming, Ready or Not). She writes, "Asteroid collisions are more fun to watch on someone else's planet. 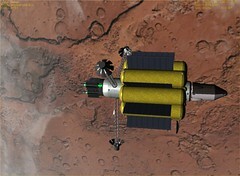 The Dawn spacecraft has begun its cruise to Vesta by 2011 and Ceres in 2015. A few scientists are proposing a crewed mission to a near-Earth asteroid using an Orion spacecraft. More than just big rocks, the asteroids are new worlds that could conceivably harbor life." The picture above is one of my Orbiter screen captures on Flickr, showing a simulated Dawn firing its ion engine near Ceres in 2015. Speaking of close encounters, the Planetary Society Weblog reports that Earth itself had one just the other day (December 31). Fortunately it was one of our own exploratory spacecraft (Deep Impact) just passing by for a brief visit and to take a few special pictures of the Moon, as Emily explains. Wondering where you are? Astropixie tells us that as of January 2, you’re as close to the sun as you ever get, here on earth at perihelion. She also explains why it’s still so darn cold (at least up here in the north) and shows some really cool analemma images. Rainer Gerhard’s Spaceflight blog digs into the ongoing troubleshooting of sensor and feedthrough connector problems on the soon-to-launch (we hope) shuttle Atlantis. What do space shuttles and Christmas lights have in common? Read his post and find out! And if you want to learn something about where space shuttle External Tanks are produced, A Mars Odyssey has a profile of the Michoud Assembly Facility in eastern New Orleans. Lest you get too happy or optimistic, even with a new year dawning and all, the Space Cynics have a quick lesson on the dangers of external market forces and how a downturn in the economy, being triggered by a housing market collapse, can dash the hopes of space enthusiasts (Housing, Homer, and Space...). Of course it wouldn’t be a new year without a few looks back at the one just completed. Riding with Robots has a nice video collage of images of 2007. CollectSPACE tells us about the 70 or so books on space exploration history published in 2007 and noted by the American Astronautical Society History Committee. I did a bit of looking back myself, though I allowed Alan Boyle’s Cosmic Log to do the heavy lifting on summarizing the past year in space. I mostly summed up my own year in space, looked way back at Apollo 12 and 15, and flew a few simulated Apollo landings on the moon. And that's how I spent my winter vacation. I hope you enjoyed this week's carnival (be sure to also see this bonus post with a few more entries for this week). If you are interested in participating in or hosting future carnivals, check out this page at Universe Today. This blog is usually about space, technology, science, education, books, and the future (and sometimes music). It's not that I'm unconcerned about social and political issues, it's simply not the focus of this particular blog. But I just read an article from Paste Magazine about an estimated $31 billion industry that simply should not exist in the twenty-first century: the world-wide trade in human slaves. This is not the first thing I have read about this horrible situation, but the figure of some 27 million slaves in the world today reminded me of the scale of the problem. More people are living in slavery now than at any time in history. It's happening all over the world, including the United States, Europe, and other "advanced" countries. How can that be? I usually don't recommend books unless I have read them, but I have to at least mention a book I have just ordered on this subject, Not For Sale by David Batstone. The subtitle just about sums up the situation: "the return of the global slave trade - and how we can fight it." This is a pretty unusual post to start the new year with, but I think this is an important issue that everyone should know more about.